The members of the WVHS Robotics Team and A-B, their award-winning robot. 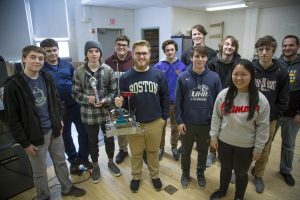 Warwick Valley High School’s new Robotics team is already competing at the regional level, collecting wins with a robot named A-B and poised to become a true force on the robotics scene. And yes, there’s a robotics scene, and it’s made up of some of the most innovative, collaborative, and imaginative young thinkers around. They’re currently competing in the First Tech Challenge, in which more than 5,000 teams vie for the top spot. The WVHS Robotics Team last month competed at the First Tech qualifying tournament in Yonkers and have advanced to the Regional Championships, to be held Feb. 10 at Pace University. Members of the Robotics Team work on A-B. The robot was inspired by the Mars Rovers. ing and math teachers accepted into the program. 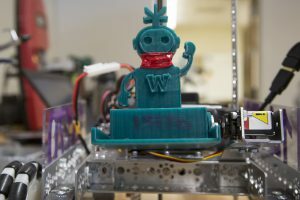 He launched the high school’s first robotics club at the beginning of the school year. Warwick Valley students are introduced to robotics in the Middle School and a core of robotics enthusiasts had been lobbying for a club. Ivy Yang, a junior, jumped at the chance to join. She was introduced to robotics in her other STEM classes and was instantly intrigued. She wanted more. In the club, she says, the students can really dig into their project and explore their interest. “The work we can do in the club is far more advanced than anything we’re doing in the classroom,” says Mr. Stolt. Trophy, the Robot Team’s mascot. Trophy was created with a 3-D printer. In all, 21 students in grades 9-12 make up the club and the team. There are regular meetings during lunchtime, but members are also in and out of Mr. Stolt’s classroom throughout the day and after school to work on A-B. It’s a large group – bigger than most robotics teams – but its formidable size means there’s plenty of ideas and expertise to go around. “If you can help, you try to help,” adds senior Alfanso Lagares. Building a robot is a long process of trial-and-error and the road to success can be littered with frustration. In fact, there’s a storage tub at the back of the room, filled with a jumble of robot parts that didn’t work out. But that, the students say, simply comes with the territory. In the end, though, the team built A-B, a lean and dexterous little robot inspired by the Mars Rovers, which scout the surface of Mars collecting data and images. A-B is designed to efficiently collect “minerals” – represented with square plastic cubes and white Whiffle balls – as it navigates a barren terrain. A-B is light and comparatively small, able to out-maneuver the heavier and more complicated robots at competition. First Tech requires that robots weigh no more than 42 pounds, and many approach that maximum. A-B weighs in at a wiry 10 pounds. At the tournament, A-B will compete in a series of matches against other robots. Team members will also interview with judges who will assess their achievements in engineering, design, and community outreach. The team, meanwhile, is looking forward to its debut at Regionals.